What a (verbal) turn-around. After more than 60 years of ‘Development Co-operation’ and almost 15 years of grim trade negotiations under the mantra of ‘Economic Partnership’ between the EU and the African Caribbean Pacific-Countries, and in particular sub-Saharan African states, the government has finally grasped the ongoing public criticism of the official development policy. The notion that ’Development Policy’ was just a kind of all-round positive charity that benefits the poor would have continued to inform Germany’s Africa policy if 2015 had not happened. This was when the so-called refugee-crisis broke loose and about one million refugees mostly from Syria and Central Asia but also from Africa came to Germany. Since then it has become obvious – now apparently also to some government officials – that migratory movements of people from Africa (and other war-zones all over the world) will continue to increase, as long as young people have no incentive to stay. The ‘2015-refugee-shock’ deeply influenced the political aims and objectives that the government sought to achieve during its presidency of the G20-Group in 2017. This was seen as an excellent opportunity to put in place a joint international initiative that would help to keep thousands of refugees out of Europe. The initiative Pro!Africa launched by the Federal Ministry of Economic and Energy Policy (headed by Brigitte Zypries of the SPD) might by the one with the shortest lived. Pro!Africa at its core is a programme to promote German private investment in Africa. These investments are expected to create additional employment opportunities. In order to foster the engagement of German investors, the programme promises improved government credit guarantees and the support of the Chambers of Commerce as well as a scheme to promote local skills development through vocational training activities. In short, Pro!Africa follows the old arrangements simply repackaged. Furthermore, as much as it was meant to spend €100 Million annually from 2018 onwards there are no allocations for this programme so far in the state budget. This confession ties in with Chancellor Merkel’s own comment on the ‘unfair’ nature of Economic Partnership Agreements (EPAs). However, the Marshall Plan with Africa does not take into account either the challenge of the UN’s Global Sustainability Goals nor the differentiation and diversity between African countries. The programme might in one way or the other continue since the CSU’s Gerd Müller the former Minister of International Co-operation and Development will stay in office. Nevertheless, it remains to be seen to what extent the original plan will be implemented in the light of the declining importance of the department of development inside the new government. The third initiative is called Compact with Africa and the Marshall Plan with Africa share the astonishing fact that they do not have a specific budget. In fact, no additional funds are allocated to these initiatives. This is particularly strange since the Compact has been launched under the guidance of the Federal Ministry of Finance, then headed by Wolfgang Schäuble of the CDU, during the Conference of the G20 Ministers of Finance on the 30 March 2017 in Baden-Baden. So, the Compact with Africa is the only document that has been prepared in cooperation with IMF, World Bank and African Development Bank prior to the G20 summit which took place on the 7-8 July in Hamburg. The commitment of the G20 as well as the involvement of international financial institutions makes the Compact the most likely that the three initiative, to survive the post-election confusion in Germany. In other words, within the framework of the Compact’s selected African countries – the first five are Côte d’Ivoire, Morocco, Rwanda, Senegal, and Tunisia, followed by Ghana and Ethiopia – commit themselves to assiduously follow the prescriptions of the G20 and the international finance institutions in order to improve their investment climate and to reduce the costs of doing business. Only then can they hope that private investors will acknowledge these improvements and start to invest. But these are just hopes, there are no guaranties at all. Altogether, the three German Africa initiatives have one common denominator: the role that Germany wants to play in Africa’s development is no longer left to the traditional tools of development co-operation. The common understanding that ‘migration dynamics’ can only be successfully controlled if the economies of African societies provides enough incentives for the young. These efforts have now been shifted into the hands of the core government departments of Economics and Finance. Consequently, the role of the Ministry of Development has shrunk. However, the Compact not only has a number of serious omissions, it ignores the importance of education and does not discuss the G20’s responsibility in creating a trade and investment environment, it is also silent on social and environmental risks associated with private investment and fails to take seriously a comprehensive sustainable development agenda. Above all it builds on highly questionable assumptions. The most serious assumption is the conviction that private investment simply depends on the correct frameworks but ignores the importance of profit for private entrepreneurs. But where should the profits from infrastructure investments come from? Moreover, since the initiative is obviously aiming to build up industrialization which can only take place with domestic consumption and local demand, how will the required purchasing power be generated that will render private manufacturing in Africa profitable? Interestingly these questions are not addressed in any of the new German and G20 Africa programmes. This deepens the suspicion that these profits shall be generated by converting official development aid, which is essentially taxpayer’s money, into private gains for multinational investors. So, these initiatives might end-up serving public-private-partnerships where the state (in Africa) receives ‘development aid’, then pays with this aid-money the profits of institutional investors (pension funds, banks, insurance groups etc.) who are seeking compensation for currently low interest rates in Europe and North America. It seems that Germany’s recent turn to Africa is another false dawn. Arndt Hopfmann studied Economics and African Studies at Karl Marx University in Leipzig between 1977 and 1982. He holds a PhD in development economics. After his academic career he took up various positions in the Rosa-Luxemburg-Stiftung (a political foundation/think-tank close to the Left Party in Germany) with which he worked as head of its regional office in Southern Africa (2003–2006). Currently he is researcher and senior advisor on economic and trade issues to the Foundation. 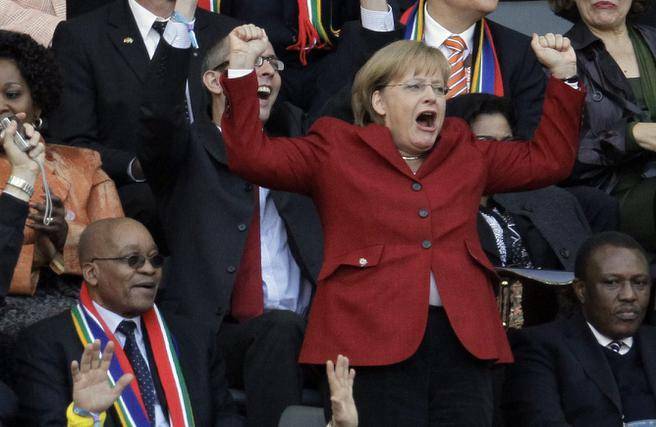 Featured Photograph: German Chancellor Angela Merkel celebrates during the 2010 World Cup quarterfinal between Argentina and Germany in Cape Town, South Africa.